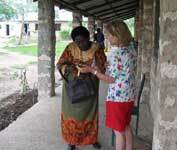 The association BAHATI was founded in 2002 by Dorothea Wenzel. While working as an aid worker in Kenya (1972-75) she worked together with the social worker Kauchi Chivumba in the village development. During a visit in the mid 90's, Dorothea Wenzel was led by her former colleague to her former projects. Motivated by the fact that since the 80s, the level of illiteracy had risen again and the fact that only 25% of girls were enrolled in schools, she laid the foundation for our current work. 1995 Kauchi Chivumba was sent as a delegate of Kenya to the World Conference on Women in Beijing. There she learnt that their home district Kwale is one of the most backward in the world, especially in regard to education and vocational training of girls and women. Our long-term partner looks after our sponsored girls with great dedication and personal commitment. She manages the school fees and thus your donations to BAHATI. The global AIDS problem has led to an increased number of orphans especially in Africa. Since education from kindergarten up to the university is chargeable, many families strain as they do not have the financial means. In very poor areas the little money is often still used exclusively for the education of the sons. Orphan girls who are raised by the grandparents, relatives or neighbors, often end up as cheap workers and receive no education or a professional training. BAHATI covers the costs of the 4-years secondary school as well as vocational training or higher education for AIDS orphan girls in Kwale district, Kenya. Furthermore, we support schools and educational institutions in Kwale district through small projects. We plan and implement water and solar projects, so as to inspire a better understanding in dealing with resource-saving and renewable energies. To establish a relation to the donated materials and supplies, the involvement and collaboration of parents, young people and schools is always important. Kwale is one of seven districts in the Coast Province of Kenya. The people live mainly from agriculture and animal breeding. Only a minority finds work in the cities or tourist areas. The standard of life is far below the European. Poverty and disease are widespread. A one-time donation. Large and small amounts are welcome. A regular monthly donation. With an amount of your choice. You make no contractual commitment and help only as long as you want or can. According to § 10b EStG donations are special expenses and therefore tax deductible. At the beginning of the following year, you will get a receipt from us. Please include your address with all donations.